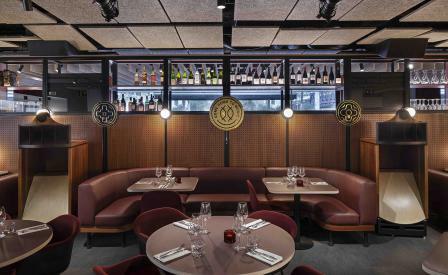 With admirable subtlety, Spiritland, London’s newest restaurant, gives a well-executed nod to its surroundings: one of the capital’s biggest performance venues, the Royal Festival Hall. One part of a city-wide trio of spaces for music lovers, and hosting a series of talks, events and salons, Spiritland is rightfully billed as a place for those who enjoy music. Equal reverence is paid to food and drink, with an all day menu conceived by chef Moondog that touches on international cuisine and sharing plates, while an oyster bar and open grill kick things up a notch. Setting the stage is a dining room designed with the input of co-founder Patrick Clayton-Malone (who co-founded Canteen restaurant, which previously occupied the site) that is evocative of an old school music venue, characterised by meandering booths, perforated wood screens and heavy velvet curtains. Metres of burgundy leather and terazzo, exposed bulb lighting and a wall feature hewn from acoustic foam further punctuate the Spiritland’s tribute to music, cemented by a programme overseen by artistic director Paul Noble and arts broadcaster John Wilson.